As heavy metal fans should already known Ronny Munroe is the lead vocalist of Metal Church. And of course Metal Church just released the solid "Generation Nothing" last year. Outside of his duties with said classic heavy metal/power metal band Ronny (also ex-Paladin, ex-FireWölfe, ex-Presto Ballet, ex-Rottweiller, ex-Brutal Godz, ex-Far Cry, ex-Glamm Slamm, ex-Lillian Axe and ex-Sea of Souls) has managed to pull off a respectable solo career. 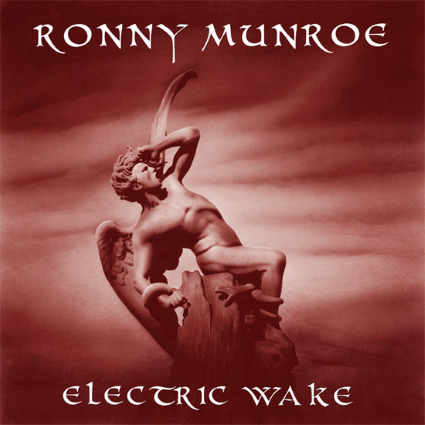 As the solo follow-up to Ronny Munroe's "Lords of the Edge", which was released in 2011 to so-so reviews, "Electric Wake" is tailor made for fans of classic heavy metal. Hell, the promo material here states as much and with a few key guests in tow* this enthusiastic front-man (here at least sounding like he went out and bought every Iron Maiden, Judas Priest and Dio album out there so that he could envision the ultimate heavy metal front man and then transfer it to tape! )offers up a collection of tracks that combine the aforementioned three acts with the likes of Metallica, Megadeth and (of course!) Produced by Bruce Bouillet and mixed by Jon Wyman, "Electric Wake" features guitarist George Lynch cutting lose on "Ghosts" with numbers like "Burning Time", "Turn To Stone", "Sleepless Mountain"** and the title cut following suite and giving traditional heavy metal a big old high five! Then you have "My Shadow" and "United" where Ronny and company take on "The Dark"-era Metal Church (and turn the tables by taking things into thrash territory! ), the riff-heavy crusher "Ritual Murder", "The Others" (This cool number featuring Pamela Moore and Dave Rude of Tesla is kind of hard to describe as it almost comes off as heavy rock and alternative rock meeting up with modern metal in order to tear a underground punk club down!) and "Pray" (a dark take on post-grunge/hard rock). For this Metal Church member it's all fair game and yet "Electric Wake" still comes across as the real deal. It's all part of one complete, fully-assembled project that should be a sweet treat for heavy metal fans young and old! * On Ronny Munroe's 3rd solo outing we have guests such as George Lynch, Tesla guitarist Dave Rude, Pamela Moore (Queensryche's "Sister Mary"), Paul Kleff (ex Firewolfe), David Donigian, Sean Baker and Tony Rossi. **Love the solo guitar work here!